This condition is believed to be due to irritation to the main sensory nerve in the back of the head; (that which supplies all of the skin and pain sensitive structures in the upper neck and back of skull). It is believed that this irritation may be caused by tightness in the muscles, joints or ligaments of the upper neck, thereby putting pressure on the nerve itself and causing it to become irritable and painful. Neck injuries, postural strain, and viral infections are amongst a number of other potential causes of irritation to this nerve. The pain has been described as a continuous aching/throbbing in the base of the skull, and back of head, with occasional referral (pain travelling) into the forehead/face regions. Occipital neuralgia- like most other types of headpain; needs to properly diagnosed, and all causes identified. Treatment of this condition should be aimed at eliminating causes through the appropriate therapies/advice/medications, and allowing nerve irritation to subside. Serious causes should always be excluded through professional examination and diagnosis. Neck problems may contribute to Headaches and Migraines, so it is important to have them professionally addressed. It is also important to investigate for other potential causes, as many cases of Headaches and Migraines have more than one ingredient. 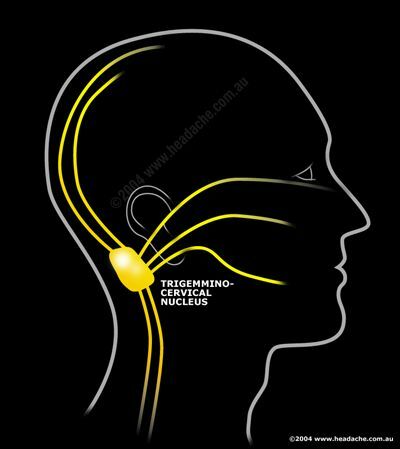 The Trigeminal nerve is the main sensory nerve to the face, jaw and front of the head. Pain along this nerve and its main three branches usually leads to severe pain in the face and usually occurs after 30 years of age (can also occur in cases of Multiple Sclerosis at any age). Patients with Trigeminal Neuralgia have extreme sensitivity in the face region and will usually avoid touch to sensitive areas- which can trigger an attack. Pain is usually described as “sharp” or “stabbing” and lasts for short periods only (usually seconds) with a number of attacks occurring back to back. Glossopharyngeal Neuralgia …(similar to Trigeminal Neuralgia but involves the ear and tonsil-throat area). Post Herpetic Neuralgia– thought to be due to herpes virus invasion of sensory nerve endings and their relays (known as ‘ganglions)…very severe, but not common. Treatment for most Neuralgias involves medications as well as treatment of any underlying problems.All Neuralgias should be properly investigated by a Neurologist. For further information please see the rollover sections on the homepage head illustration to see specific problems in specific parts of the head, neck and face.